As I mentioned last week, I ended up with pages worth of notes after this year’s Frontiers of New Media symposium and a number of ideas that have been floating around in my head ever since. I decided to start by talking about my impressions of the presentation that was closest to my own research, hence, this post will be all about videogames. More specifically, I will be talking about Clare Woods’ presentation about the portrayal of books and libraries in World of Warcraft. Her arguments, as I saw them, mostly revolved around two central themes. The first was that books as in-game artifacts are completely divorced from the methods of their production. The second theme was that the implementation of books in the game world is shallow. In both cases, she didn’t argue that the game’s final design was necessarily bad, but that the designers had missed opportunities to make the game more meaningful and engaging (and maybe even *gasp* educational). World of Warcraft is nothing if not immersive. Although “realistic” may not be the correct description for a virtual world populated with elves and trolls, the designers at least went out of their way to make it “internally consistant” in that the game conforms rigorously to the conventions of the neomedieval fantasy MMO. The landscape is marked by tall stone towers, quaint villages and other appropriately archaic architecture. People may be running around with huge glowing swords, but there are also people mining iron, smelting steel and generally supporting the huge glowing sword industry. Despite a number of deliberate anachronistic elements, such as the conspicuously capitalist nature of its supposedly feudal society1, the game stays true to its pseudo-historical setting…except perhaps when it comes to books. As Woods pointed out in her presentation, there are a number of public libraries in World of Warcraft. Given the value of books during the middle ages, this ease of access itself is somewhat ahistorical. Perhaps more problematic, however, is that these libraries have a distinctly modern layout. They primarily consist of the easily recognizable stacks that one might see in any local library today. What is absent from these medieval libraries are the desks, the lecterns, the scribes – everything associated with the production of books. Historically, books were incredibly valuable, both because of the resources involved in their production and because of the small number of people skilled enough to actually write them. While you can become a scribe in World of Warcraft, this profession is centered around creating exotic inks to craft magic scrolls and charms, not the traditional books you find in the libraries. Those books are simply there, sitting on shelves, lying on tables. ﻿﻿As Woods noted, we’re never encouraged to give up our modern notion that books are cheap and common. 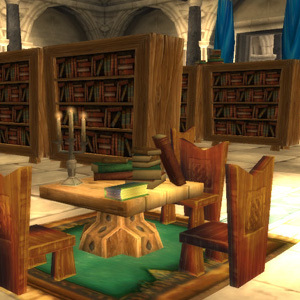 When the player does interact with those books, at least the few that are not simply part of the background, they generally give a small snippet of game lore. Many players might find a few paragraphs of fictional history less than compelling, especially when there is so much else to see and do in the game world. Of course, there are still those out there who really love lore, but for the majority of players, books are little more than decoration. The recurring question throughout Woods’ presentation was how could the developers have made books more useful to the players? I think that the best way to address that question is to look at the way that books are implemented in other games. Not surprisingly, the first game that came to mind as I was listening to her presentation was Minecraft. Of course, there are no classes or professions in Minecraft, but if one was to analyze my style of play, I think that “scribe” would be an appropriate title for my character. As soon as I had managed to build a secure shelter, I set out to make myself some books. Unfortunately, making books in Minecraft is a fairly labor intensive process. This was especially true for me, as my home island didn’t happen to have the resources to make books. 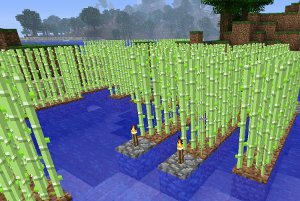 Thus, the first step in my quest was to construct a boat and set off in search of sugar cane (originally known as reeds). I found some growing on the shore of a nearby island, which I harvested and took home. Of course, two pieces of sugar cane isn’t enough to create a book, so I began cultivating it on my island until I had a decent amount stockpiled. I was then able to take it back to my workbench and craft it into paper, which I would in turn craft into books. I then took my new books and some wooden planks and set about building bookshelves. Eventually, I was able to create enough books to build my own library within my tiny hobbit hole. 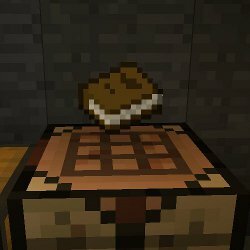 Although Minecraft portrays the process of book production in a much more detailed way than World of Warcraft, it shares a similar problem in that there isn’t really much you can do with books yet (Notch has suggested that books may eventually be usable, just as maps are). For now, they are simply ornamentation for the game world, rather than a meaningful part of it. One of Woods’ suggestions for increasing the depth of in-game books beyond their current state was essentially to crowdsource it. 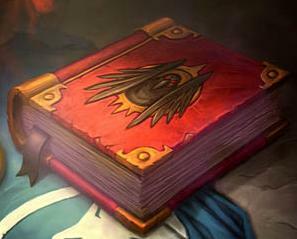 Rather than the developers slicing the fictional history of Azeroth into enough tiny slices that one can be placed in each book in the library, why not take advantage of the in-game history being made by the players themselves? After all, the whole premise of the game is that players get to run around doing heroic things all day. If even a fraction of this activity were recorded, it could easily fill every empty tome in the game. So what would such a system look like? There is already a great deal of content being created by World of Warcraft fans in the form of both fan fiction and art. Could it be a simple matter of making a way to display such content in-game? It’s hard to say if such an approach would be compelling. Even though millions of people are embarking on quests every day, they pretty much embark on the same quests over and over. Most players would probably rather go battle dragons themselves than read about another player doing the same thing. While there are certainly unexpected happenings that occur while on these quests, including the occasional Leeroy Jenkins moment, the structure of World of Warcraft is somewhat limiting to its literary potential. This doesn’t mean that such an approach is impossible within the framework of a videogame, it just requires a different approach. A good counter-example is Dwarf Fortress. With it’s ASCII graphics and Everest-like learning curve, it may not seem like a likely candidate for creating more engaging stories. Nothing could be further from the truth. Dwarf Fortress is essentially a complex simulation for generating unique narratives. Not only does the game task itself with generating a complete world map when you start a new world, it creates a complete history of wars, nations and heroes. Every dwarf who comes to your fortress has his or her own story, and it’s different every time. Whereas no one wants to hear the story of the awesome loot that dropped when you killed Rend Blackhand, tales of fallen fortresses are spread far and wide across the Internet, even if only among Dwarf Fortress‘ cult following. You would be hard-pressed to find a dedicated Dwarf Fortress player who hasn’t heard of the sagas of Oilfurnace, Boatmurdered, Bravemule or Bronzemurder. Even a novice like me (who has yet to have a fortress survive the first winter) can get almost as much enjoyment out of hearing the experiences of others as playing for himself. World of Warcraft images from WoWWiki. 1. Games of Empire. Nick Dyer-Witheford and Greig de Peuter.